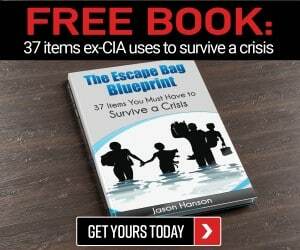 Imagine the following scenario: for 2 years you have meticulously planned and researched what you and your family will need to survive a crisis. I’m not talking about a little lights-and-sirens disaster; I mean a big, soul-chilling catastrophe. You have accounted for every variable, anticipated every pitfall and allowed for all contingencies. 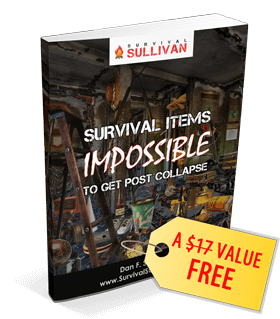 You’ve calculated how much food, water, ammo and medical supplies you, family and friends will need to persevere and survive. Every conceivable tool, asset or provision you may need has been stocked, tallied, counted and stored securely. You are as ready as ready gets materially. No imagine if you will that all of those supplies disappear. Imagine the blood-curdling, clammy fear, the choking despair that you’d feel. Imagine how much worse it may yet be if this were to happen before or in the immediate aftermath of a crisis event. For all of your clever planning and studious preparation, you forgot to protect the things that are part and parcel of your chances at survival. Be honest: you just imagined yourself valiantly but grimly driving off a roving band of looters hell-bent on taking what’s yours in the dusty, smoking ruins of society, didn’t you? It’s alright, it is a common thought among preppers, and indeed that exact scenario is part of what I am talking about today. But it is the other, less dramatic occurrences that are waiting to strip you of your carefully stocked stash. Things like simple theft, pestilence, spoilage and simple mishaps or accidents. Not every circumstance we’ll discuss today is truly preventable (how to you prevent any one-in-a-million chance) but much of it is if you are engaged in proper locating and preventative maintenance of the items in your stockpile and the place the stockpile is located in. Your method and location of storage will dictate to some degree how much or how little upkeep and preventative measures you will be instituting, but some things will be universal no matter where and what you are keeping. Below I’ll discuss a few important concerns when it comes to preserving the integrity and security of your precious stash. Some are naturally occurring, some result from the actions of man, but you can reduce the chances any of them will befall you through proper procedure. Where is Your Stash Located? Where you have your stash sited is an important factor in determining what must be done to keep it intact. If you have your supplies located inside your home, assuming it is built to modern standards of habitability, you will have done much of what you can to ensure the safety and security of your supplies, as moisture levels and pest populations are likely already low, and physical security will be much simpler to ensure than one that is sited away from the home or scattered. If your stash is located outside the home itself, say in a garage or insulated outbuilding, you will need to be more vigilant about all of the above; pests will have much easier access and thieves have an easier time breaking into both compared to a home. If items are located outside outdoors for whatever reason, either under a simple shelter or perhaps buried, assuming you have invested in the most appropriate containers for storage infiltration by water and pests will still be a major concern. Larger four-legged raiders like raccoons will become a problem for some. If not actively protected or completely hidden anyone who happens by could steal from you. If burying your supplies in one or multiple caches, the site you choose will be paramount for both security and accessibility. You might choose to locate one or all of them somewhere along your escape route so that they can be accessed when bugging out, but the more traveled a route is the greater the chance that it will be discovered by someone else. Take pains to perfectly conceal the site and redress any evidence of your activity. Ensure no landmarks or waypoints are discernible as a signal to any passersby. While not likely if your cache is buried deeply and well concealed in normal times, you must anticipate things like floods or other disasters shifting earth and perhaps revealing it. Regular travelers of the same path may notice disturbance of soil where you have initially buried or come back to do a status check on your goods. If you decide to bury your cache in an open area, especially one that is easy to dig, metal detecting enthusiasts might easily discover it. As a rule of thumb, site your cache well above the water line and out of any regularly flood-prone areas. You must take all necessary precautions to positively locate your stash’s coordinates using landmarks and measurements. Give careful thought to landmark selection: GPS coordinates are great, but the GPS network might be down on during the real thing. Things like trees and plants are comparatively easy to destroy. Even medium rocks and boulders can be shifted by flood, earthquake or landslide. • In false gravesites in cemeteries. 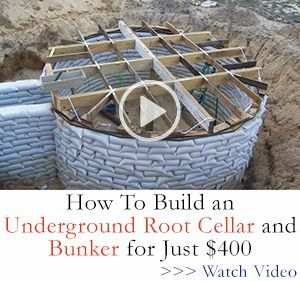 You can read more on underground storage and hiding caches here and here. Larger four-legged raiders like raccoons will become a problem for some. If not actively protected or completely hidden anyone who happens by could steal from you. I know the above scenario is not the go-to for most of us, but I am including it here for completeness. A fair name for a German death metal band, but more importantly one of the primary threats to your supplies. Preventing natural decay, expiration and contamination from pests is a never ending chore, but one that must be done. Regarding pests and mold, depending on your locale, environment and storage conditions this will be a major concern or a small one. Simple spoilage and expiry of goods is a constant no matter where you are. Pests come in many forms, from the exploratory nibbling of mice, rats and other vermin to infestation from any of the hundreds of kinds of insects. Either can ruin foodstuffs either by breaching sealed packaging or breeding inside it to contaminate it. Prevention is a matter of knowing your enemy and employing suitable countermeasures. If mice, rats and other rodents, are detected or suspected around your stockpile, locating their ingress and nesting areas should be first priority. Kick them out before you try to keep them out. Once that is done, place appropriate traps along likely lines of movement to destroy any stragglers. Take care if using poison, as it may be ingested directly by a family pet or small child, or the dead pest could become a secondary vector if eaten by another animal. Triple-check all containers and vessels for signs of intrusion. Dealing with insect life is harder in some ways and simpler in others. Most insect infestations in the home, like the classic roach parade, follow on the back of general filth and untidiness. Keep your place clean, especially areas where food is stored or prepared and you will have less insect infestation all around. Tiny pests like weevils and mites are notorious for infesting bulk foodstuffs like grains and pastas. Prevention is easy if you buy pre-packed and sealed items. If buying large quantities of loose grain or similar and transferring to your containers, make sure you are buying from reputable sources, and use clean and sterilized tools and containers to effect the transfer. Your other major concern for food items is simple spoilage. The sell-by date is not always reliable, coming or going; you must be rotating your food supply to prevent keeping items past their prime, or worse, way past the point of palatability, or even safety. This is a great case to stock items in formats that you enjoy on a regular basis, as you can be drawing older stock from stores to cook with or eat and then replacing it with fresh the next time you hit the grocery. If you think you can open up a 7 year-gone can of tuna or stew and chow down with no consequences, you may be in for a long night and rude awakening. You have been warned. Mold and rot can affect things besides food: things like leather, any kind of fabric, paper and some plastics are vulnerable to rot from disuse or lack of care. Mold will of course bloom nearly anywhere it can spawn, but permeable materials are most vulnerable to mold outbreaks and the hardest to cure of it. Mold is often, though not always, a bonafide health hazard and must be prevented if at all possible. Moisture is the emperor of mold, and darkness is its ally. Keeping moisture levels as low as possible and taking pains to let air circulate among your supplies is critical. Things that are crammed together and packed away far from the light and air are highly vulnerable to mold formation. If you notice small, dusty patches of mold forming on your items, take the time to pull everything out for inspection and cleaning. Look up proper procedure for remediation depending on the material. A good wipe-down with a strong disinfectant or mild bleach solution may be adequate. Let everything dry out before re-emplacing it. Accidents and destructive mishaps can happen anytime, and an otherwise minor inconvenience could turn into a huge loss of money and effort if your stockpile is compromised or destroyed. A moderate water leak or weather related flood event in the home will usually spell disaster for whatever is in the basement, a common place for locating your supplies. Anything worth keeping that you decide to keep in the basement should be kept off the floor by at least 6 inches. Aside from buying you a little time and insurance against flooding, this will also promote good airflow and help protect against mold, mentioned above. A fire is a huge threat to the home itself, and doubly terrible if it wipes out your stashed supplies. Take the time to invest in smoke detectors to place near your supply room, and you had better already have and know how to use quality, high-capacity fire extinguishers and have them located in strategic points throughout your home. Take care that any shelving you are employing is sturdy and installed properly. Freestanding or wall mounted, a shelf that breaks away or falls over from an accidental contact or from that last box of .22 ammo may create more than a big mess. Broken or damaged equipment or breached seals on containers may mean you can no longer count on an item being sanitary or keeping for a proscribed amount of time. This results in wasted money and effort, and plenty of frustration. Assess your stash location and dwelling with an honest eye and anticipate what might befall your items. Your preps are as vulnerable to theft as anything else you own. The only question is whether or not a thief determines they are worth taking. A common burglar in normal days may be looking for things he can fence, so food items, clothes, most tools, etc. will not likely be targeted. You had better believe things like guns, ammo and generators will be. Loss or destruction due to ransacking will of course be a concern. 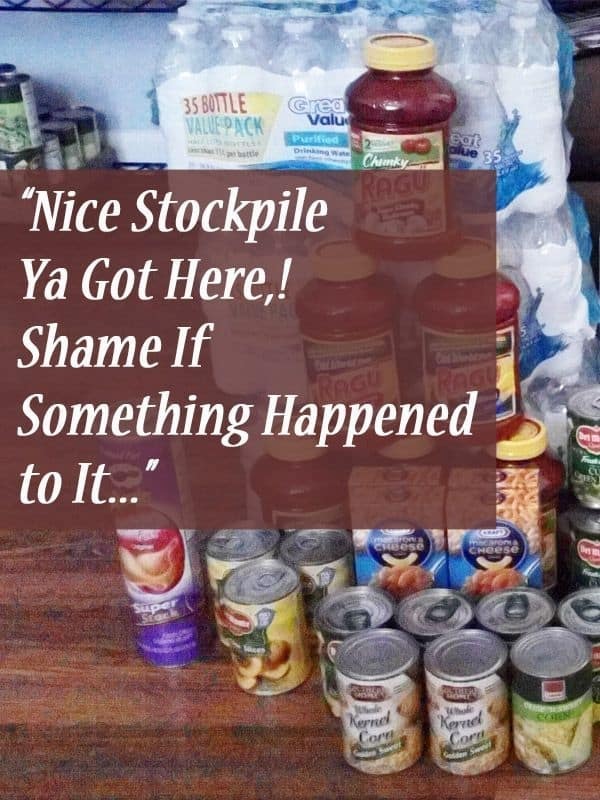 Sadly, your stash may be targeted for theft either before or after a crisis by some criminally enterprising prepper, and possible someone you have some social connection to. They may not be a friend, but they might be a friend of a friend, or a relative of a friend. It is for this precise reason you must treat security of valuables, in this case your carefully stocked and stored preps, accordingly and stop telling people about it! It is no one’s business but yours, and even people you trust beyond all others may talk or mention the presence of your stockpile offhandedly in the presence of the wrong person who can then employ a little social engineering and open-source intelligence gathering to either plan a theft or put a new pin on their map of “Places to Raid When End Comes”. Make sure that isn’t you. Whomever you let into your “inner circle” or mention your preps too must be both personally trusty and trusty enough to keep their mouths shut. It is impossible to determine how far a careless mention can travel. Similarly, keep obvious tells that you are prepping or of a prepper lifestyle off social media sites. If you are participating on forums and blogs (like this one!) to learn and plan, that’s great, just tale pains to ensure your personal security (PERSEC) procedures are in gear and you are maintaining your anonymity as much as possible. Sure it’s great to meet new and likeminded people, especially ones in your area that you may be able to mutually aid, but do not forget that scumbags across the globe utilize forums for knowledge gathering as well as preliminary targeting purposes. Treat information as a precious commodity: guard it jealously. Your stockpile is the sum of all your hard work, knowledge, care and concern. It will form the lynchpin of your survival efforts in the event of a long-term crisis. Whatever dollar value yours is, the universal economy of need in the aftermath of a major event will see that same stash of food, equipment and other provisions become impossibly valuable. For that reason, you must take the time to look inward instead of ahead and ensure the safety and security of your stockpile is accommodated in order to make sure it is intact and ready to supply you and your companions against whatever hostile world you may find yourself living in. I guess the modern version could be. “Big mouths lose preps.” Doesn’t rhyme, but the point is there. no stash however big is going to last the rest of your life, that’s where skills and knowledge and self reliance come in, if you haven’t got any of these then you are only delaying the inevitable. Your stash, no matter how big or how small, IS likely to last you the rest of your life. How long that life is depends on how good you design and protect your stash. I tend to agree with John on this one. People die rather quickly when they don’t have food. This particular “stock” is essential, and the most care must be taken with it. Humans are large animals and we must eat a lot to stay alive. There is no way to do the science fiction trick of getting by with a lima-bean-sized nutritional pill taken once a day. Lots of stable foods kept out of obvious view in as many different and distant places as can be managed – that’s the ticket to keeping alive. For the longer term, you’re going to need seeds of plants which are likely to grow in the disaster aftermath. Same strategy – a main stock in the freezer, and backups in several out-of-the-way places. All we’re doing is trying to improve the odds of survival. Hardly anyone will survive a 1 megaton nuclear explosion half a mile away. Or an Obama-Type drone missile landing on our head. None of us will be alive if a thousand ISIS-type organ-eating killers come to our particular neighborhood with the intention of wiping us out. There is a chance we can keep ourselves and our neighbors alive in disasters short of the utterly impossible ones. Your point about knowledge is well taken. Knowing a dozen offbeat ways to start a fire can substitute for the theft or destruction of your stocks of matches and lighters. Understanding the importance of “clean” and “sterile” can partially substitute for the lack of antibiotics. And so forth. Nevermind “Loose lips”. There were plenty of posters warning against hoarding, which was illegal. Chances are, if a war or emergency situation comes along, the government will ban hoarding. Men with guns from the government will come to your house to take everything and redistribute it. Who knows about your cache? Did you tell people? Oh, you have a website so that 4.3 billion people can see that your are a prepper (hoaarder). Not smart. Your point about hoarding is an important one. In a “mild” disaster I’d expect The Authorities to make raid to confiscate your stocks and make a big deal of handing them out to ‘deserving’ folks in nursing homes and orphanages. In an “end of civilization” event those same Authorities would use the information they’d been given by Homeland Security to make the same raids, but this time they’d keep the stuff for their own friends and families. Assume we were having this discussion on the “letters” page of a magazine or newsletter 50 years ago. I figure the same types of agencies would be collecting the subscription information and addresses as they are now doing with the Internet. The process is just easier for them now. Hahaha…. nooo. The government isn’t going to take away the food from people to give to other people. They take my food to give to you… well, now they have to take someone else’s to feed me. Get if? The powers that be however, will, in the early days of a SHTF raid warehouses and such, calling it emanate domain and such. Also… the government will not have the manpower to go to all the small towns and counties to flush out the approximately 3+ million dedicated ‘prepares’. something I learned finally in my youth … no matter what your best intentions are – treat the item(s) that you are putting on a shelf like you won’t be touching it again for 5-10 years >>>> good chance you won’t – pack it correctly – protect it against rust & dust and ever present bump & dent – when you do actually need it – you won’t be spending hours repairing it …. The posting and all replies are spot on. I think the biggest concern is the government taking your supplies. In a SHTF situation, you won’t hesitate to drop an intruder in his/her tracks to protect you, your family, and your preps. A squad of soldiers or a swat team is another thing all together.